Well with the season over it's time to get busy in the garage. It's funny, I read an interview with Guy Martin the other day in which he said that racing was a bit like groundhog day, in that when the season finishes, the next one starts with getting bikes preped. How right he is. My first job was to have a look at what needs doing to my 600, which I'm 90% sure I will be using instead of my 400 next year. The last time out for her was at Tandragee last year, as at Cookstown the following weekend she had developed a leaking fork seal,so wasn't taken out. I fixed the leak so took her to be put on the Dyno to sort the fuelling, something which I'd never had done on her before. So I loaded her up and took her to Double Take Motorcycles in Southampton, who do all my Dyno work. I got a call from them to say she was only putting out 87hp, standard they are over 100hp, and with a race can and performance air filter mine should've been even higher. I brought her home and checked the compression, all was well there. I checked the timing, and again all was good, so the mystery started. I read that a clogged fuel filter had similar effects as to what mine was suffering. Basically they make great power, but once they get to about 11k revs, it just runs out of steam. Kawasaki don't list a fuel filter for mine, as it's part of the pump. 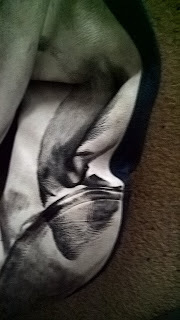 But luckily some detective work paid off and I found one. Once fitted it was back down to the Dyno. Luckily the guys had a road ZX6R in for some work, so after much faffing around we got the ECU off and tried my ECU on their bike. Sadly because of all the anti theft electrickery that is on bikes these days, it wouldn't even prime the fuel pump, so it all had to come back off again. Fair play to the guys for all the help they gave me, and cups of coffee. To let me crack on and do the work myself, which obviously saved me a bundle of cash, was a real bonus. Still we did come to the conclusion that the problem lay with the ECU.I had noticed that mine had a red sticker on and their one had a black one, which got us thinking. So with her loaded up I set off home and this morning fired up the interweb to see what I could find. The best thing I found was the phone number for Cradley Kawasaki, who I've bought loads of stuff off for my 400 in the past. The guys there were also a great help, and after telling me that the frame number I gave them was for a 400, thought it couldn't get any worse as it now looked like it had a dodgy number, they then did some digging and found out that it was originally an import form America. Guess what? American bikes are limited to 85hp. So that was one question answered. Now how do I sort this? In short the Americans don't use the same anti theft device we do here, so it's not a case of simply getting a full power ECU. I can't even have the ECU reflashed as they are designed not to have this done to them. So the only way to solve it, is to buy a UK ECU and wiring loom, and fit this. I only wanted the fuelling checked!!! So I'm now on the hunt for these bits. Still if it means that I'll get another 20hp, happy days. After all 20hp down on the rest of the field is a massive disadvantage. I had hoped to do a track day at Brands in a couple of weeks if the weather held, but think I will be better off sorting the bike and doing one next year to see how she rides with the extra horses. So with the 600 sulking, I decided to move onto the minitwin, as I want to put new rings in her. Luckily she came apart easily and she is now sat waiting for the rings and gaskets to arrive for fitting, which will hopefully be next week. In other news, I've seen that next years Manx Grand Prix will have two lightweight races, as opposed to the one they usually have. I'm going to put an entry in, and fingers crossed will get an ride. All I hope is that this will be a separate race, so more people can race, and it's not just going to be a repeat of the lightweight race held earlier in the week. But nothing would surprise me with The Manx these days. Talking of which, I wrote to the deputy clerk of the course to ask if there was a reason why I can't seem to get an entry. She passed it on to The Manx Motorcycle Club, who replied that I'd just been unlucky. 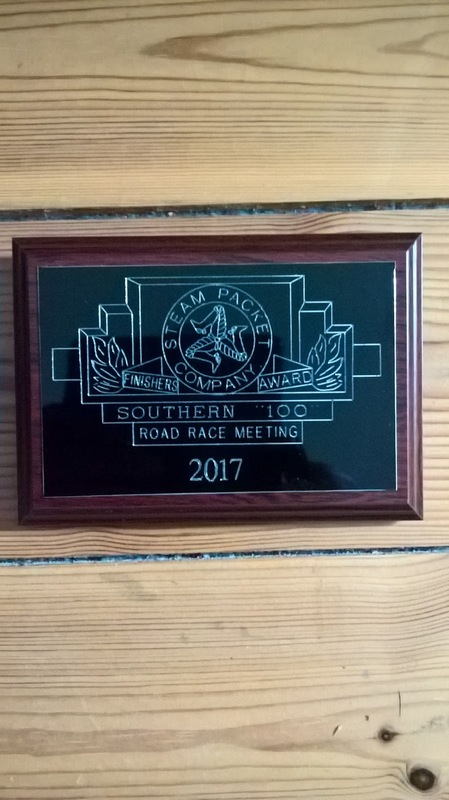 Not really the answer I wanted, as I found out that there are about half a dozen guys who I race in the same class with at the Southern, and I do better times than they, and beat, get an entry for The Manx and I don't. It can't be because my face doesn't fit, as it was shaped by one of their Doctors! So there you have it, I've not been lazing around watching Jeremy Kyle in the down time, I have been busy, and hopefully some, if not all, my hard work will pay off. Until next time, when it will be all good news. So after what seems like 5 minutes, it was off to my last race of the season. I set off and after almost 15 minutes I reached Thruxton on Friday evening with Stuart, who was there to give me a hand getting scruitneered. With the bike and leathers all checked, I signed on and was still home in time for The Simpons at 6 o’clock. Saturday morning I met up with Steve, who was going to come up by bike, but the weather was wet, so he came by car instead. This meant it was a swap to wet tyres for the first practice session. I got to the holding area early so switched the bike off. Come time to go out and she wouldn’t start. Luckily I got a bump start from a chap so set off. Sadly I only got as far as the chicane and she cut out, and refused to start so had to be recovered at the end of the session. Back in paddock we tried in vain to bump her, so swapped to a spare starter motor which I had after she played up at Cadwell earlier in the year. Luckily she fired first time and I managed to get out for practice. I’m glad I got out as she felt loads better compared to last year, bearing in mind the forks were bent back then. Back to the paddock and there was just time to top up with petrol and I was back out again. I got a decent start and stayed with the pack for the majority of the race, having some good battles with some guys. I finished 18th out of 25, so was quite pleased with that, especially as I did a lap 7 seconds quicker than last year. I had quite a few visitors who came by to say hello, including two armed with cameras. So I’d like to thank Mark and Rob for these pictures of me. I had to wait until the last but one race for my second outing of the day, thought it was going to get dark before I got out again. Luckily the sun stayed around until my second race. I started further down the grid due to my finish in the first race but got away ok. Sadly I still suffer from losing my way once I lose the tow, so ended up having a lonely race, still didn’t finish last, but felt I should’ve been further up the finishing order. All in all it was a good meeting, obviously helped by being just down the road, just a shame that there are not more meetings there. So that was the last race and it’s now time to start on my Winter jobs list, which is shaping up nicely. I will keep you up to date as I whittle the list down, as well as what my thoughts are as to what my plans will be for next year. Well it was back to Cadwell Park for my last visit of the year, so hoped to end on a high. Sadly I woke up on Friday to monsoon type conditions. I managed a couple of practice sessions, but it was more a case of survival than getting any valuable track time. The only outcome was I manged to not come off, which is more than a lot could say at the end of the day. I'd hoped that the clouds had rained themselves out so that Saturday would be better, but no such luck and Saturday was just as wet. I still went out for qualifying, but didn't even complete a lap as it was so wet. I felt my decision was justified as my first race was just as wet, which I'd decided to sit out due to the conditions, and was just no fun. The trouble was that the circuit would just start to get dry and then it would tip it down again. The second race was due to start just after another down pour, so didn't go out, which was a shame as by the time the race got under way it had started to dry out a bit. I checked with the race office that I would still be able to race Sunday as long as I qualified in the morning, which was confirmed. Sunday started wet again, so I just wobbled around for the session, but at least I could race. The day got better as it went on and by my first race, dry tyres were back on so I lined up at the back of the grid, as I expected after my qualifying session. The race went well, but couldn't make up any places as everyone just got further and further away from me. I wasn't surprised that I'd only manged a best time of 5 seconds slower that I've been round before. The second race didn't go any different, so was frustrated that I didn't get anywhere near my fastest time around there. After getting home I think I may have found the problem. I was under the impression that I was running 14/46 gearing, however I actually had a 45 on the rear. I checked my records and have noted down that I did my fastest time on a 45, but in my mind am convinced that I had a 46 on the rear, which means I may have written down the wrong number, as on both my visits since I went fastest, I've used a 45 and not gone any quicker. This coupled with my lack of practice due to the weather may have been the answer, or so I hope. Oh well I can't do anything about it now until next year now, which is a shame. 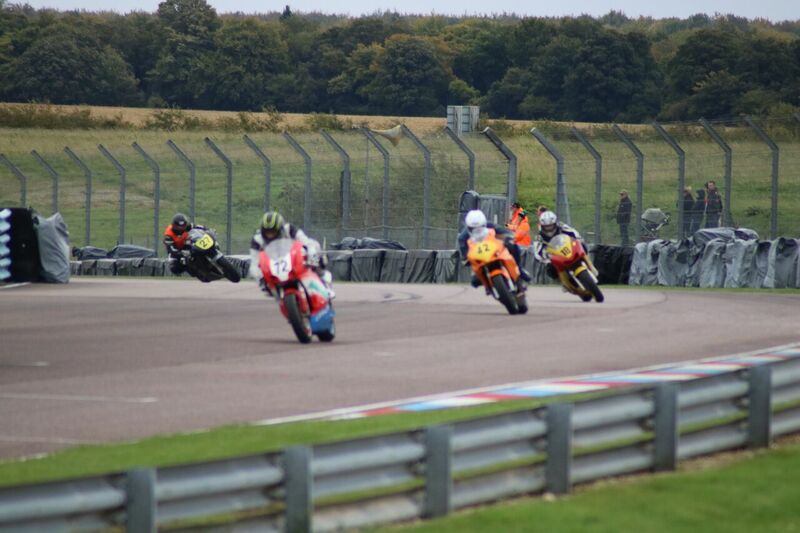 Still hopefully I will be able to make up for it at my last meeting of the season at Thruxton on 7th October. At least this year I will be turning up with straight forks, which is more than I had last year, so that should help. Fingers crossed it doesn't rain for that one. Well last weekend it was off to Cadwell for another weekends racing with the Auto 66 club. The last time I raced with Auto 66 was Scarborough back in 2013. That weekend didn’t work out how I planned, so I hoped this weekend would be better. John and I arrived on Friday evening and set up camp in what seemed to be a very empty paddock. After making home, we had a walk around the paddock. At this point I was somewhat concerned as I only saw half a dozen bikes, most of the paddock was taken up by go karts. John actually asked if I had the correct weekend. Still when we got up Saturday my concerns were laid to rest as there were more bikes than we’d seen the previous evening, which was a bit of luck. John took the bike for technical inspection, only to arrive back shortly as the rear brake wasn’t working. After an adjustment on the rear master cylinder all was working, so was given the all clear to race. I headed down to practice and was amongst a wide variety of machines, which was just as well as there were only 5 Minitwin/Supertwins listed in the programme. 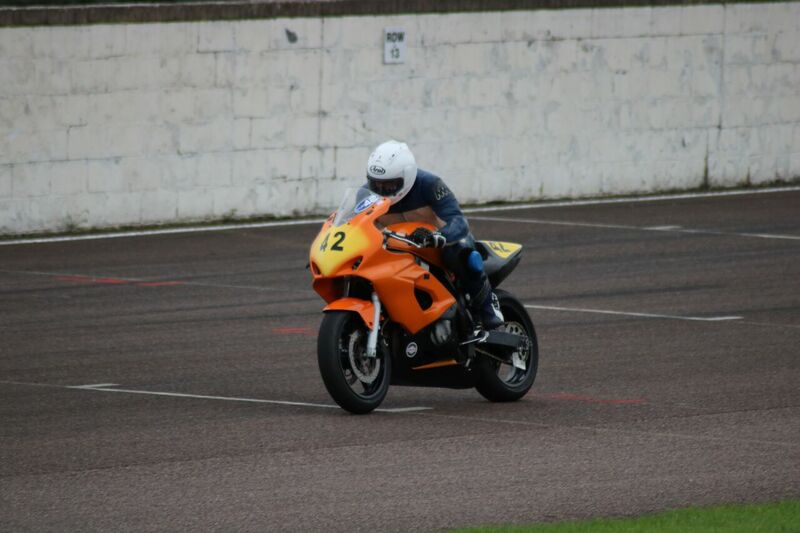 Practice went well and had a good dice with a guy on a supertwin, eventually getting the better of him. So it was time for my first race, which I didn’t get a great start in and found myself amongst a load of CB900’s and GSXR750’s. The CB’s had handlebars roughly half the width of the track, so overtaking was interesting. Still I got passed a couple and had a good race with a guy on a GSXR750. Times were a couple of seconds off what I had done before, which I put down to a different gear ratio I was trying. When we got the times I decided to go back to the previous gear set up to improve my times. In The second race I was quicker, but still not as fast as had been, but I did have a good race with the guy on the Supertwin who I’d practiced with earlier. I was actually quicker than him on lap times and had a faster race time, but just couldn’t get passed him. He crossed the line 3 tenths of a second before me, it was that close. Sunday started with another practice and I was 6th quickest overall, and second fastest SV650, which was good, so I hoped grid positions would be done on this, but sadly it was taken from finish positions from the Saturday race, so started in 13th, unlucky for some. I managed to get a good start and saw the supertwin not get a great start, so was happy to be in front of him. Things were going well until I tipped into a fast right hander, called ‘Charlies 2’. As I tipped in I hit something so had to stand the bike up, which caused me to run onto the grass. I’ve run onto the grass before and thought I was safe, until the front went down a rabbit hole and I went over the handle bars. So decided it was probably best just to lay her down, which I did. When I got up I saw the bike that hit me. Yes you’ve guessed it, it was the supertwin I’d been racing with. We were both put in the ambulance and taken for a check up by the track Doctor. Whilst in the ambulance the rider told me he went for a gap which wasn’t there so had no choice but to run into me. 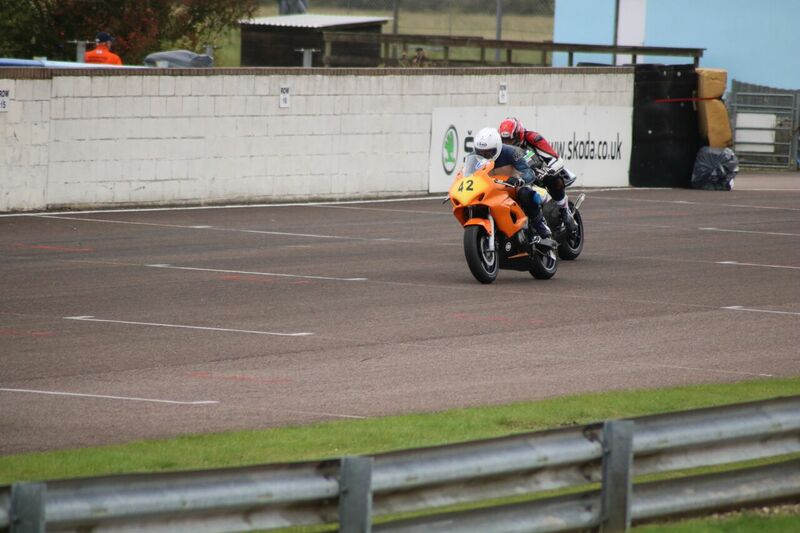 As you can see from the picture below how close he was, the black mark up the arm of my leathers, is off his tyre. Luckily we were both given the all clear by the doctor, so set about repairing the bike. Luckily it was mostly levers that took the brunt of the impact, those that couldn’t be replaced, were hammered back into shape. With the bike fixed I set off for the second race. I wasn’t at my best as I banged my knee when I came off, and as time went on it started to stiffen up and got harder to push down on. Got a good start and it was more a case of making sure that there wasn’t any other damaged that we hadn’t seen, my biggest fear was the forks could have been bent, but luckily they hadn’t. Had a good battle with a few different guys, but still didn’t improve my previous visits time, but I wasn’t that surprised by that, all things considered. It was a strange meeting and just didn’t really feel like it was a proper meeting for some reason. It was well run and relaxed, but just seemed to be missing something for me. So I now have a few things that need some attention and I’m currently waiting for my knee of many colours to arrive, which is coming on nicely. All being well I’m out at Cadwell next in September, so hopefully I’ll get the bike all sorted by then. For those of you who enjoyed the highlights last night, part two is on same time next week, Thursday, ITV4, 8pm. Just found out that ITV4 are showing highlights of this years Southern 100 at 8pm, Thursday 20th July. Keep your eyes peeled for number 99. I’m writing this whilst looking out of the window, with a view of Snaefell. So yes, I’ve been racing at The Southern 100 on the Isle Of Man. Neither Steve nor I could believe it was a year since we were last here, seems like yesterday. Sunday was the usual scruitineering, and chance to catch up with some familiar faces. Was good to catch up with some of the guys who I raced with over in Ireland over the last couple of years, and hear the latest news, which included the concerns around the paddock about if Killalane will run, still doesn’t sound hopeful. Both bikes went through technical inspection ok and so was due out on 400 first. She seemed a little reluctant to start but when running sounded ok. As soon as I left the dummy grid I knew there was something wrong, but hoped it just needed a run to clear her as she felt as if she wasn’t running on all cylinders. It was quite clear she wasn’t going to clear, so ran her back to the paddock. Luckily I spotted the problem straight away, a wire had come out of the connector to one of the coils, so a nice easy fix. So it was back to the van to investigate. It looked serious and as I was out soon and the second 400 practice was looming, I realised that it wasn’t going to get fixed, so that was the end of the 400 for the week. It’s really annoying as the engine had ran fine last year and hasn’t been apart since then, so what is the matter I really don’t know. Still, it was now time to take the 650 out. She was running fine and I was catch the 4 guys that had set off in two groups ahead of me, so was feeling good. Before I went out the forecast was for local showers, so when I got spots of water on the screen I didn’t worry. 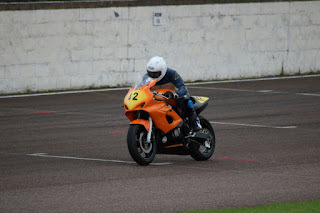 Shortly after my foot slid off the footpeg, so I then started to think it wasn’t rain. Looking down at my temperature gauge my fears were confirmed, she was over heating, so pulled in and waited to be collected by the course car. Word of advice to the organisers, please don’t get course cars with leather seats in to collect riders, as race leathers on leather seats have the same amount of friction as ice. This resulted in me spending half the ride back behind the passenger, and the other half behind the driver, all the time trying to get my seat belt to connect. On the plus side, the water from the radiator did wash off the oil from the 400, so all worked out nicely in the end. With the bikes loaded we headed off to base to have a think about what we were going to do. Tuesday morning arrived and we set about checking the 650 over. I drained the oil and what I put in came out, so no excess fluid had got into the engine, which happened the last time I had problems with the cooling system. Likewise the water level stayed in the same place in the radiator, so more good news. Steve had found out that SV’s are prone to getting airlocks in the radiator if filled too quickly. I’ve filled the rad many times and had no problems, but on this occasion it was looking like that I had managed to trap some air in there. As we could find nothing else we headed back to the paddock for practice to see if we had cured the problem. Practice went well, and despite endlessly watching the temperature gauge, I managed to knock a second off my previous fastest time around the circuit, which I was very happy with. On the way back we worked out what the qualifying time was, and I was well under it, so happy days. We went to the race office on Wednesday to see what grid position I was in and couldn’t see my number there, so went and asked at the race office. I was told that I had qualified, but they were only allowed 32 riders on the grid, and I qualified 34th. 34th doesn’t sound great, but there was 50 entered, so not too disappointed. Luckily the guy just in front of me was there and was told that one rider had dropped out, so I was now 1st reserve. This meant that I was to take my place on the grid, do the sighting lap, and see how many had turned up to race. I did my sighting lap, and sat anxiously waiting to see if I could race. Luckily I got the thumbs up, so got my head down. It was a good race and was just coming onto Great Meadow when the leaders flew passed on the final lap. Still I was just pleased to have had a race. With the bike loaded we set off back to base with a smile on our faces. We arrived at the paddock on Thursday morning knowing that I may well not be out in the race today, but luckily Steve said we should get the bike through scruitineering first and then check with the race office. This was a wise move as the scruitineer noticed the tyre valves were loose, so couldn’t pass me. We got the wheels off double quick so new ones could be fitted, whilst Dave Clarke, went and checked to see if I was racing. 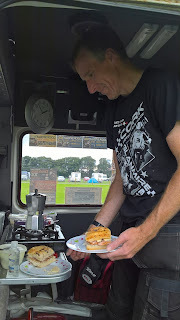 Whilst refitting the wheels Dave came back and told me I was once again reserve for the Supertwin race, but was on the third row for the Support race, one I didn’t even know I was in for. With the wheels back on, bike was checked and passed, so we were good to go. Again I was lucky enough to take part in the Supertwin race and had a much better race. As well as not being lapped, I also knocked another second off my fastest time, so still improving. After having a mild panic about fuel, or lack of, for the extra race, we had loads, all was looking good. Whilst sat in the holding area it started to rain, so we hoped it wasn’t going to last, and luckily it didn’t. The race started and from my ninth place on the grid I set off and was 3rd into the first corner, which was great. I was overtaken by one guy on a straight and stayed with him through all the corners only to loose him on the straight again. My main racing partner this week was Kevin ‘Irish Ago’ Murphy, and sure enough he too also overtook me on the straight. The three of us had a great dice, which included us being 3 abreast on the brakes into a corner, and Ago and myself side by side coming out of Cross Four Ways, and looking across at each other whilst willing our bikes to accelerate quicker than the other. When we crossed the line the three of us were covered by just over a second, which was great after such a good race. I eventually finished 6th, and had improved my time by another 3 seconds, so a cracking race all in all. When I caught up with Ago later, he admitted that we were level ability wise, but his bike just had the extra speed on mine, which was a nice compliment as Ago was one of the guys who was way ahead of me the first time I raced the course. So by the end of the week I’d finished all 3 races I started in, improved my lap time by 5 seconds in total, and got another finishers medal. If you had told me at the end of Monday evening, with a broken bike either side of me, that by the end of the week I would have been faster by 5 seconds than I’ve ever been around the course before, and that I would have finished sixth in a race, I’d have thought you were mad, so just goes to show don’t give up. I really do think the extra track time I’ve had this year has helped and think that if I’d had the extra laps of the practice session I missed, I could’ve been a bit quicker. It’s really odd because, even though I have been round the corners loads of times I still have to build myself up to going quick around them. For instance, I know I can go round Stadium Corner with just knocking it down a gear, however at the beginning of the week, I brake and come down two gears, why I just don’t know. When I get around it I ask myself why did I slow down. Strange how the mind works. So that’s it for another year, is always a shame when it ends, but hopefully I will be back next year, but I’m going to have to have a long hard think about what I will be racing as I now have doubts about if the 400 will last, which is a shame as love riding her., but we will see. Not long to wait for my next race, as all being well I will be at Cadwell the first weekend in August back on the Minitwin.